In this paper, yarn and fabric properties made from Rieter air jet and rotor open end spun yarns have been investigated. For each spinning system, three different yarn count were spun, also a single Jersey plain knitted fabric was produced from each yarn count. Statistical analysis clarified that both spinning system and yarn linear density affects most of the yarn and fabric tested properties significantly. Results showed that air jet yarns are stronger, regular and have fewer neps than rotor yarn. Furthermore, yarn properties were reflected in fabric properties as well, i.e. air jet fabrics were found to have a higher value of bursting strength, abrasion resistance and they are smoother than rotor fabrics. 1. W Klein, Manual of Textile Technology: Short-Ttaple Spinning Series, The Technology of Short-staple Spinning, 2nd ed. Manchester: The textile institute, 1998, vol. 1. 2. W. Oxenham, "Fasciated Yarns – A Revolutionary Development," Journal of Textile and Apparel, Technology and Management, vol. 1, no. 2, pp. 1-7, 2001. 3. H. G. Ortlek and S. Ulku, "Vortex Spinning System (MVS) and Yarn Properties," Tekstil & Teknik, pp. 222-228, 2004. 4. A. K. Soe, M. Takahashi, M. Nakajima, and T. Matsuo, "Structure and Properties of MVS Yarns in Comparison with Ring Yarns and Open-End Rotor Spun Yarns," Textile Research Journal, vol. 74, no. 9, pp. 819-826, 2004. ￼￼ 5. C. Rameshkumar, P. Anandkumar, P. Senthilnathan, and R. Jeevitha, "Comparative Studies on Ring, Rotor and Vortex Yarn Knitted Fabrics," AUTEX Research Journal, vol. 8, no. 4, pp. 100-105, 2008. 6. H. Leitner, H. Schwippl, and O. Baldischwieler, "Air-Jet Spinning – Yarns & Fabrics Compared to Established Spinning Systems," in The XIIth International Izmir Textile & Apparel Symposium, Izmir, Turkey, 2010, pp. 28-30. 7. Y. Beceren and B. U. Nergis, "Comparison of The Effects of Cotton Yarns Produced by New, Modified and Conventional Spinning Systems on Yarn and Knitted Fabric Performance," Textile Research Journal, vol. 78, no. 4, pp. 297-303, 2008. 8. G. Ortlek and O. L. Levent, "Comparative Study on The Characteristics of Knitted Fabrics Made of Vortex-Spun Viscose Yarns," Fibers and Polymers, vol. 9, no. 2, pp. 194-199, 2008. 9. M. Kilic and A. Okur, "The Properties of Cotton-Tencel and Cotton-Promodal Blended Yarns Spun in Different Spinning Systems," Textile Research Journal, vol. 81, no. 2, pp. 156-172, 2011. 10. N Erdumlu, An Approach to Investigate the Spinnability of Fine Count Yarns on Vortex Spinning System, PhD Thesis, 2011. 11. G. Basal and W. Oxenham, "Vortex spun yarn vs. air-jet spun yarn," Autex. Res. J, vol. 3, no. 3, pp. 96-101, 2003. 12. H. G. Ortlek, M. Tutak, and G. Yolacan, "Assessing Colour Differences of Viscose Fabrics Knitted from Vortex-, Ring- and Open-End Rotor-Spun Yarns after Abrasion," The Journal of Textile Institute, vol. 101, no. 4, pp. 310-314, 2010. 13. N Erdumlu, B Ozipek, and W Oxenham, "Vortex Spinning Technology," Textile Progress, vol. 44, pp. 141-174, 2012. 14. Carl A., and M. A. Baqui Lawrence, "Effects of machine variables on the structure and properties of air-jet fasciated yarns," Textile Research Journal, pp. 123-130, 1991. 15. Rasesh J., Steven M. Hansen, and Sundaresan Jayaraman Chasmawala, "Structure and properties of air-jet spun yarns," Textile Research Journal, pp. 61-69, 1990. 16. Technical University of Liberec Faculty of Textile, Recommended procedure for preparation of samples. Soft and hard sections (slices). Internal Standard No. 46-108-01/01. 17. 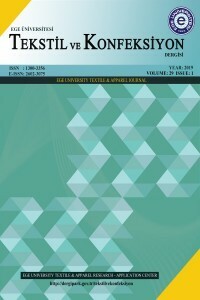 A. T. Özgüney, S. D. Kretzschmar, G. Özçelik, G., and A. Özerdem, "The Comparison of Cotton Knitted Fabric Properties Made of Compact and Conventional Ring Yarns Before and After the Printing Process," Textile Research Journal, vol. 78, pp. 138-147. 18. N. Özdil, G. Ö. Kayseri, and G. S. Mengü, Abrasion Resistance of Materials, Dr Marcin Adamiak, Ed. : InTech, 2012. 19. G. K. Tyagi, A. Goyal, and G. G. Murmu, "Structure and Properties of Yarn Made from Bamboo-Cotton Blend," Textile Asia, vol. 42, no. 7, pp. 39-42, 2011. 20. G. K. Tyagi, A. Goyal, and R. Chattopadhyay, "Physical Characteristics of Tencel-Polyester and Tencel-Cotton Yarns Produced on Ring, Rotor and Air-Jet Spinning Machines," Indian Journal of Fibre and Textile Research, vol. 38, pp. 230-236, 2013. 21. N. Erdumlu, B. Ozipek, A. S. Oztuna, and S. Cetinkaya, "Investigation of Vortex Spun Yarn Properties in Comparison with Conventional Ring and Open- End Rotor Spun Yarns," Textile Research Journal, vol. 79, no. 7, pp. 585-595, 2009. ISNAD IQBAL, Shoaib , ELDEEB, Moaz , AHMAD, Zuhaib , MAZARI, Adnan . "COMPARATIVE STUDY ON VISCOSE YARN AND KNITTED FABRIC MADE FROM OPEN END AND RIETER AIRJET SPINNING SYSTEM". TEXTILE AND APPAREL 27 / 3 (September 2017): 234-240. No part of this journal may be reproduced, stored, transmitted or disseminated in any forms or by any means without prior written permission of the Editorial Board. The views and opinions expressed here in the articles are those of the authors and are not the views of Tekstil ve Konfeksiyon and Textile and Apparel Research-Application Center.